We begin each day of preschool with fine motor practice. 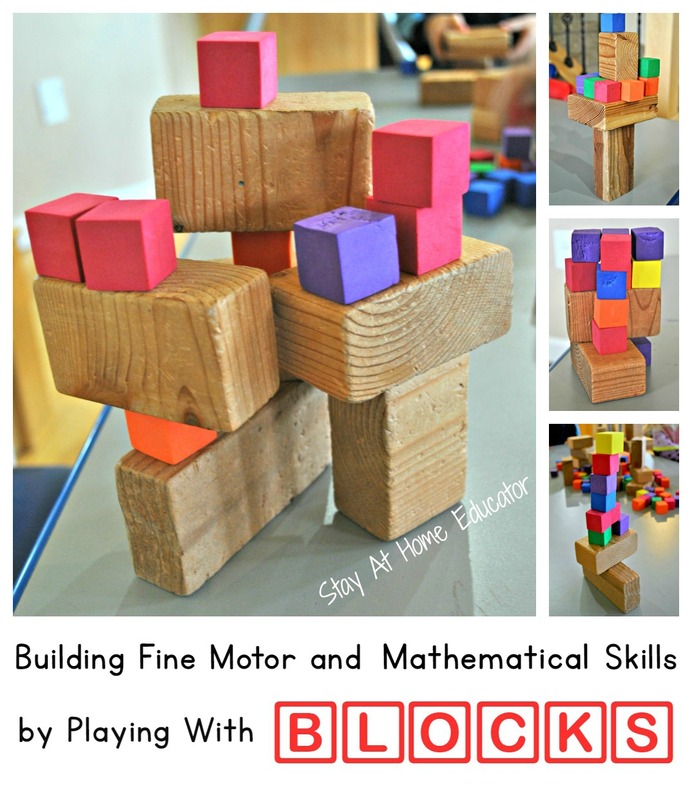 I rely on a wide range of activities for this portion of our day, and stacking blocks, building with blocks, is one of those activities. In my three year old class, spending ten or fifteen minutes doing a fine motor activity is much more effective in developing the muscles in the hand and wrist than actual writing practice. In preschool, developing fine motor skills is writing practice, so we are sure to include it everyday. For more information about preschool writing practice, read my posts Development of Emergent Writing and What Does Writing Practice Look Like in Preschool? 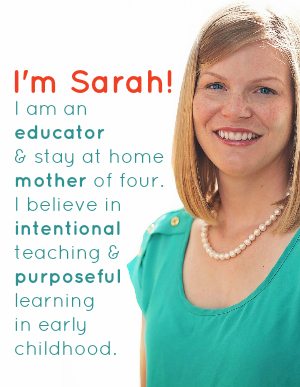 Please join me regularly via E-mail in the right sidebar, Facebook, Twitter @StayAtHomeEdu, and Pinterest. 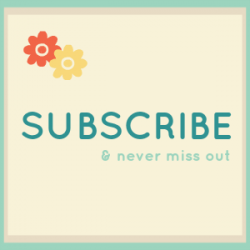 For your convince, this post may contain some Amazon affiliate links. 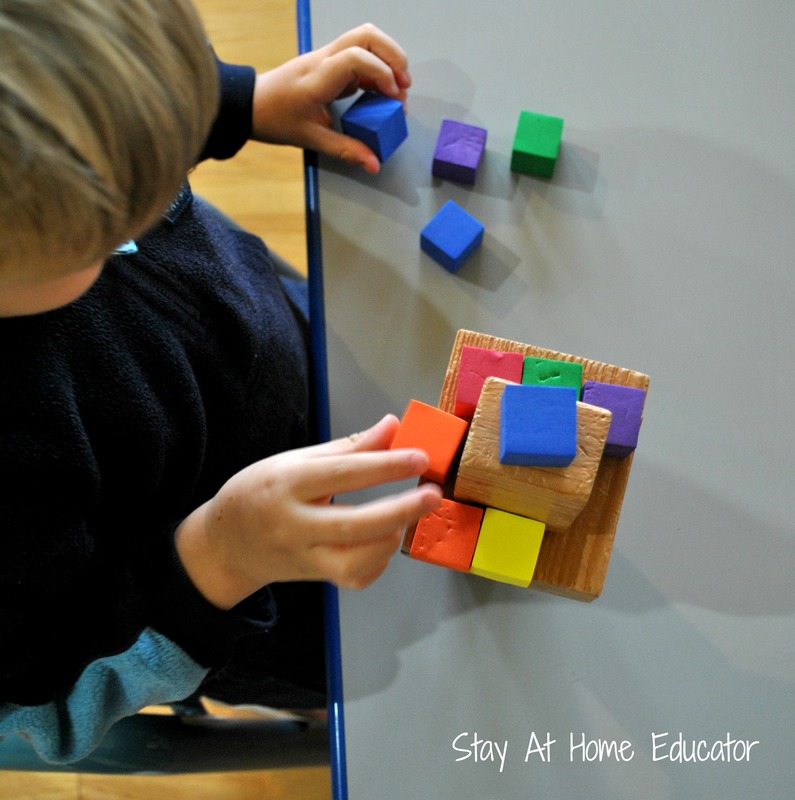 I began by scattering some blocks on the preschool table ready for the children to play with as soon as they walked in my front door. 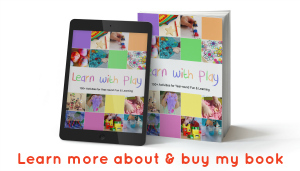 For this activity, I offered two types of blocks like these Melissa & Doug 60-Piece (affiliate) large wooden blocks, and Learning Resources Soft Foam Cubes (Set of 102) (affiliate). I offered two different sets of blocks because I wanted the children to explore the differences in weight between the heavy wood and the much lighter foam. I love hiding math in fine motor activities. I gave no instructions to the students, but gave the expectation that the blocks must be used safely. The students set to work, using the blocks without instruction, but fulfilling their own preferences for their use. 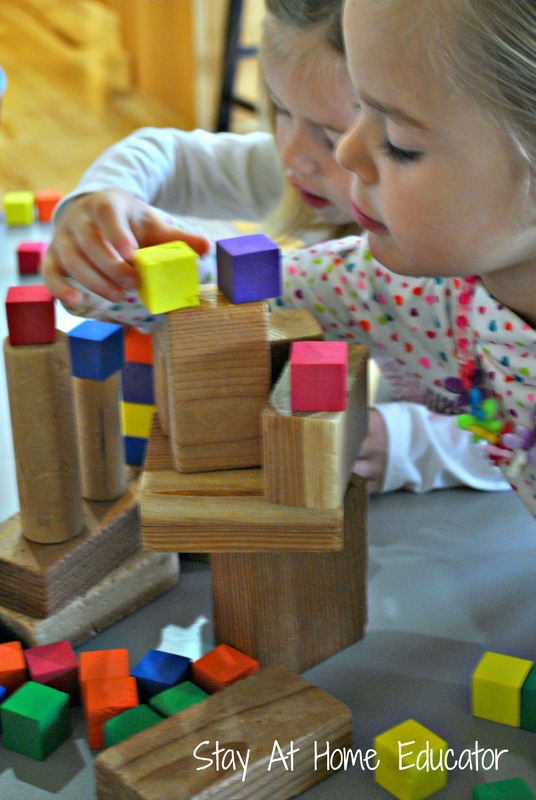 They discovered many things that morning while freely using the two different set of blocks. 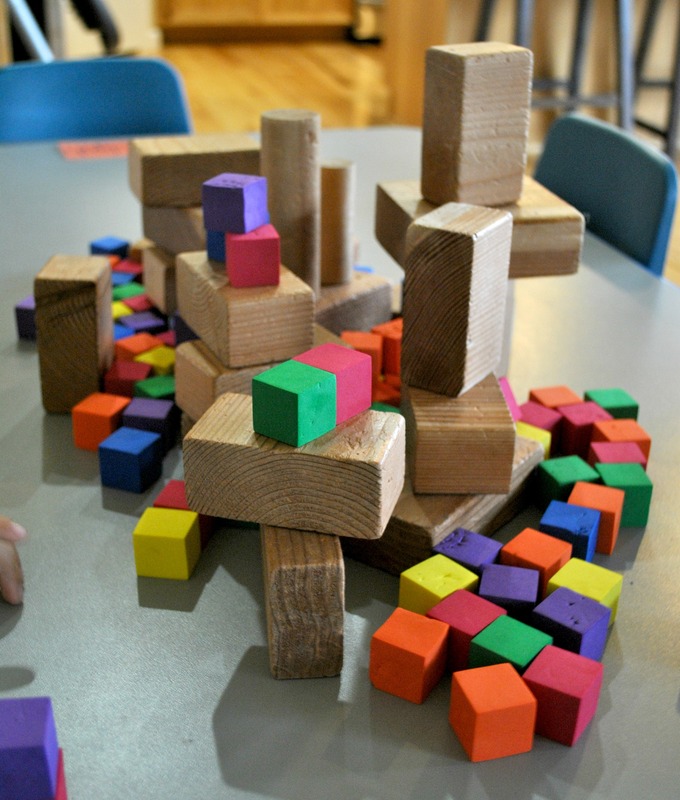 While some students chose to pull blocks from the pile set out the on table, others chose to use the pile as an inspiration and base for their work Above two students are working together to build within the pile on the table. I love how delicately their placed the two foam cubes on top of the two wooden cylinders, which are standing upright on top of two more blocks laying on their side. It was so fun to watch this student build two towers side by side, making a special effort to ensure that each tower was the same height at ever step. Students worked carefully and slowly, deliberately placing each block in its desired place. One of my favorite parts about open ended activities like this one is listening to the students talk to one another while they work. As students and attentive workers, they sharing their towers, designs, and creations with one another. They responded to one another as well, and it was delightful listening to the mathematical conversations that naturally took place. The conversation continued and the math talk continued as well. When a student made a comment that no one else responded to, I replied and followed up with a question to get the students interacting verbally again. 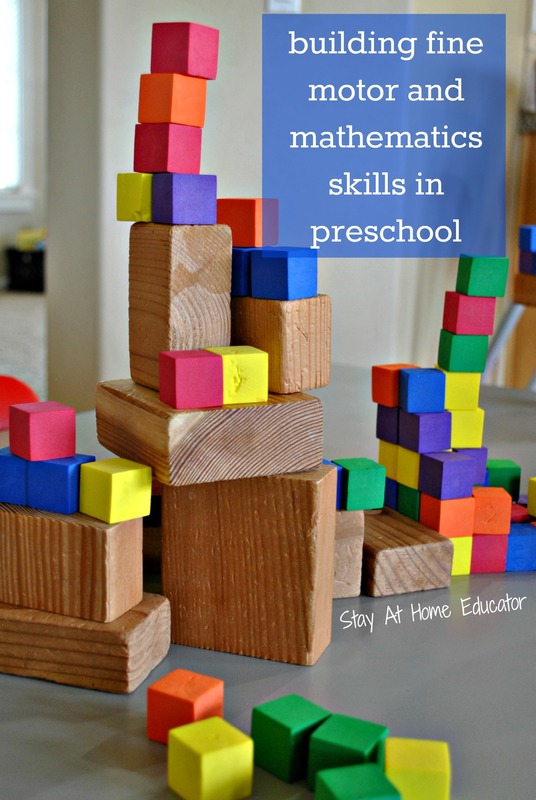 Not only is this an activity that develops fine more control, but also oral language development through the use of mathematical language. Below is an image of various towers the students created. 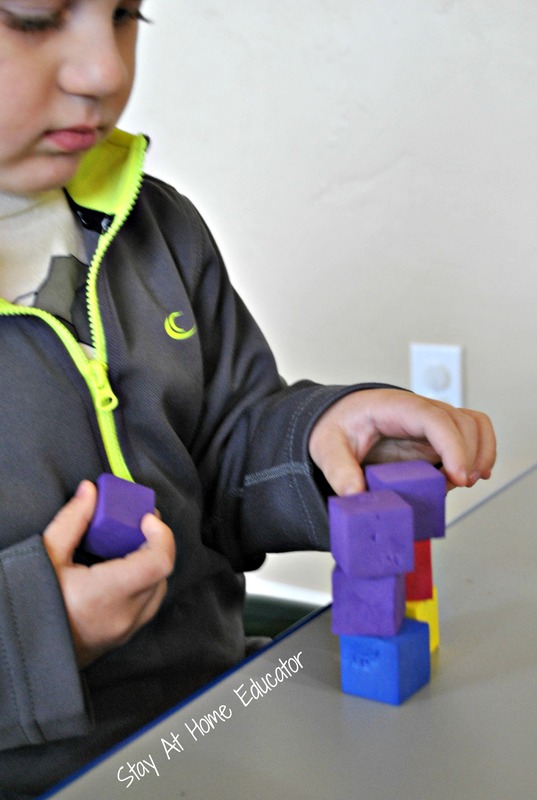 It is obvious from the picture what the students learned about balance, size, weight, and shape while stacking blocks.